Taste & Sabor is a restaurant located in the Kingsbridge section of Bronx, NY and serves Mexican and Greek specialities including gyros, tacos, salads, nachos, and traditional Greek food along with homemade desserts and pastries. Taste & Sabor uses high quality ingredients and well trained staff to create high quality food that tastes great, is always fresh, and is exciting! The staff at Taste & Sabor go to great lengths to always make you feel welcomed. Delivery and online ordering is available for those who wish enjoy our food at home. 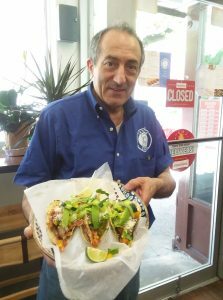 Formerly, Novelty Nachos – Taste & Sabor opened in 2018 and is managed personally by Alex and Anna, husband and wife, who have over 40 years of combined restaurant experience. Anna, head chef at Taste & Sabor, formerly led the kitchen at Avra, a fine dining Greek restaurant in Manhattan that is frequently visited by foreign heads of state and other dignitaries. Anna prepared the restaurant’s signature dishes and supervised the kitchen support staff. Anna brings her fine dining experience, creativity and cooking skill to a more casual Taste & Sabor while retaining the same focus on quality, freshness and taste! Alex, general manager at Taste & Sabor oversees operations. He brings decades of restaurant management experience and sees that all customers are treated well and have an enjoyable experience. Alex has managed several restaurants in Manhattan, the Bronx and Queens, and customers frequently stop by just to see and talk to him when dining in. Alex ensures Taste & Sabor is operating efficiently and customer satisfaction is high.